Using census data, the New York Times posted a table of birthday distributions in the United States for people born between 1973 and 1999. 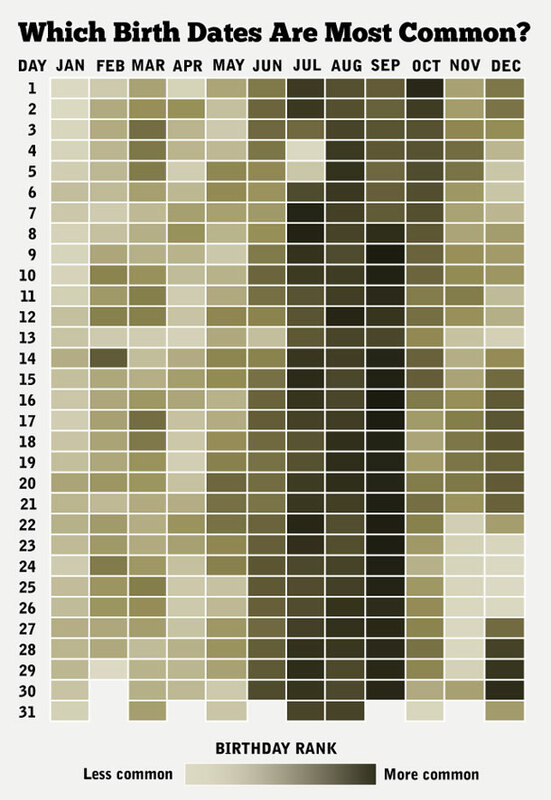 The Daily Viz then turned the table into a heatmap with the colors indicating the order of the birthdays, not their likelihoods. If you look at number of births in each month, or number of births per day in each month, the results are much flatter. Still the bias towards the summer shows up. I’m not surprised that birthdays aren’t uniformly distributed. I am a bit surprised that they’re biased towards the summer though. I would have thought that any bias that long cold nights brought, would have long disappeared with the advent of artificial lights, heat, and a move from an agrarian economy. I’d also like to see a similar charts for other countries. I suspect that if the bias is towards summer months, we’d see a six month shift in southern hemisphere nations. This entry was posted in illustration and tagged math, nytimes, populations, visualizations on June 28, 2012 by jonathan.